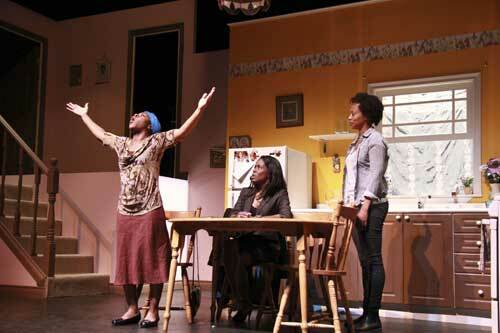 If you’re hoping to see Trey Anthony’s new play, How Black Mothers Say I Love You, playing at Factory Theatre, you may be out of luck. The run is sold out. As of Tuesday evening here were only a few single tickets left for a couple of performances. Anthony, the Canadian playwright best known for her hit show ‘da Kink in My Hair, is a child of Jamaican parents. My companion at the play, Renee, is also from Jamaica and she was looking forward to seeing whether there would be cultural references or experiences that she could relate to. There were. The first one was the set which evoked her grandmother’s kitchen. The details, like the magnets on the fridge and the pictures on the wall, made it seem like a kitchen she knew. Rachel Forbes’ set – the kitchen on one level and a bedroom up some stairs worked well. It was a very ‘grandmother’ house. Nothing fancy but homey and welcoming. In a nutshell, Daphne (Ordena Thompson) is dying. Claudette (Robinne Fanfair), her oldest daughter, has come home after three years to help Valerie (Allison Edwards-Crewe), the middle daughter, take care of her. When Claudette was seven and Valerie was five Daphne left them with their grandmother in Jamaica and came to Canada to make a better life for them. Six years later she sent for them to join her, her new husband, and Chloe (Jewelle Blackman – who also plays a mean violin), the baby. Anthony based the play on her own family’s experience and on interviews with other families who experienced the same thing. You don’t have to have experienced this kind of separation in your family to know that it’s likely to cause big issues between the mothers and their daughters. This isn’t an ‘angsty’ play. The first act in particular is very funny. You might want to bring tissues for the second act. The characters felt real to me and the dialogue seemed natural. Claudette and Valerie love and accept each other, share confidences, laugh, dance, roll their eyes at things their mother says, and sometimes get angry. Just like real siblings. My favourite character was Claudette. Fanfair was wonderful as a feisty, prickly woman whose fear of abandonment affects all her relationships. I could see a lot of myself in her. On the other hand, Claudette was Renee’s least favourite part of the play. She thought that Fanfair was trying too hard. At its heart this is a play about families, about mothers and daughters, and families are surprisingly similar no matter what their background. Or maybe mother and daughter relationships are similar. Anthony both wrote and directed the play. I thought the pace and timing were excellent. I liked the use of a blackout at the end of each scene, it delineated things perfectly. There were two things I didn’t particularly like – that didn’t seem to really be necessary. The play opened with a dance routine. It was beautiful but it seemed isolated, it didn’t advance the story. There was also a scene where Daphne is telling Claudette and Valerie about Claudette’s birth and suddenly the lights are flickery and a new character appears on the landing. I would have liked it better if Daphne just kept telling the story. My very favourite part of the performance was the audience and its reactions. The majority of the audience were black women and they were obviously intimately familiar with the situation. From the age range I would say that there were women who had come to Canada without their children, daughters who came later, and granddaughters who just knew it as part of their family story. The connection between the audience and the performers felt almost electric. The energy was palpable. The audience talked back to the characters, murmured encouragement, sucked in their breath with disapproval, laughed, cried, and clapped a lot. It was fabulous. I loved How Black Women Say I love You. I’d go see it again. Except it’s sold out. It’ll likely be back though. See it when it comes around.